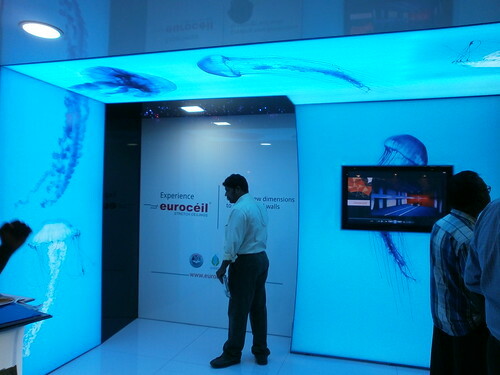 Stretch Ceiling that Mimics Nature & Glows! I went to one Architecture exhibition recently and found an interesting concept for ceilings – Stretch ceiling that can mimic patterns (including natural scenes) and glow! The above photo shows the company exhibit there – notice how the patterns on the wall continue in the ceiling. Here’s the link that allows you to (virtually) create any ceiling pattern you want. I think they are targeting the corporate sector in cities, which has taken people far away from nature. Maybe it also adds to the glitz and style, for impressing their visiting international clients. Some ultra-rich families might buy it for their homes too. So, when was the last time you slept in the open-terrace or noticed the night sky full of stars? 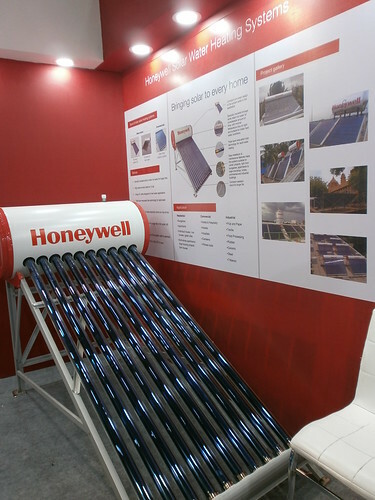 This is a solar water heater from Honeywell. I saw one more from Bosch, displayed in the same expo. That explains why I went – to learn about sustainable building technologies. It was good to see products aimed at architects/builders frequently highlighting the sustainability factor, even if it’s only recyclable. I look at the night sky a few times, but I don’t see many stars. Maybe I am viewing it early (late-evening), and hence. You may not like what I am going to write. Stretch ceiling and AAP are a fad. They both will not take off. I do not dislike AAP. I want to tell the reality. If AAP comes to Tamilnadu, then all those opposed to AAP will say these guys want to force Hindi on us because their party name is Aam Aadmi Party. I don’t want to recreate these things in my bedroom ceiling. There, all I want to do is sleep or do something interesting and not stare at the ceiling all night. Stretch ceilings… that’s a fab concept!! What would it cost to have a printed pattern in one regular room? I didn’t ask about the price – maybe you can click on the link in the post and see if they have mentioned prices anywhere on their site. I checked… it isnt mentioned on the website! Thanks for your interest in euroceil. Please contact Umesh 9176922468 or Sukumar 8754430049 for more details. Very interesting concept. We cannot predict what scientific inventions will come up in future. Even some years back who could think of marvels like skype, smart phones, and several other gadgets. We may have a make shift starry night in the comfort of our bedroom in future. I just hope all the new scientific inventions in the future will also take ‘sustainability’ component into account, in addition to whatever benefits they may provide. For example, as mentioned in their site, this stretch ceiling is biodegradable. Interesting concept. I want a starry night ceiling for my room. It would be so awesome at night. Starry Night sky is possible in digitally printed euroceil with fibre optic light. We have created such ceiling in media room of a residence in Chennai. Please visit euroceil portfolio in http://www.euroceil.com to see the picture of ceilings already installed. Thanks. I didn’t ask the prices – I think it will depend on the project and size. That’s what they would have said anyway.